Utility Poultry. How it was then. The term ‘utility’used in poultry goes back to the end of the last war 1939-45. There was a serious shortage of food, being as we were hardly getting any imports due to the UBoats stopping ships getting in from abroad…mainly the USA. You needed a ration card and if you didn’t have one you couldn’t get your grain qota..except on the black market..
To get wheat or any poultry feed was difficult to say the least and poultry farmers needed to get the most eggs out for the least amount of corn put in…(no pellets in those days) so they would usually buy chicks or growers in and grow them on or buy in at POL. Anyone that didn’t lost out to the breeders that had entered and proved thier birds. When I got to 13 years old I could work in the ‘Packing station’ where the eggs from miles around were collected by lorry..a scania in those days..and brought in for gradeing.The other side to this station was poultry meat…spent hens and stags. Late 50’s very early 60’s the incoming birds were nearly all leghorns,mainly White with Brown next and black next.A few kept Sussex and Rhode Island. I was on the Killing line….It was different in thoses days you had to earn and a school holiday job at least got me some money. The Stags were cockerels, always a cross bred,usually RIR X LS and the were big and took a lot of handleing.Some of these birds would dress out at 8lbs thats oven ready so around 11 lbs live weight. 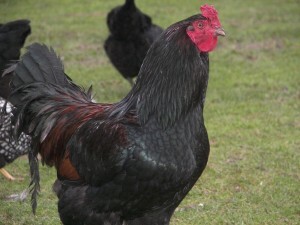 There are very few utility breeders of tradional poultry left I’m afraid. In the mid 60′ the new Hybrids started showing up..birds designed to produce eggs..the ultimate Utilty breeds and the vast majority of farmers turned over to them and a major loss to the British poultry industry started, as the strains of top layers were lost to factory type producers of the new hybrids filled the market place. PREVIOUS POST Previous post: January Diary. NEXT POST Next post: January Ramblings.